VATICAN CITY -- On Christianity's most joyful day, Pope Francis lamented the horrors generated by war and hatred, delivering an Easter Sunday message that also decried the "latest vile" attack on civilians in Syria. Both in his impromptu homily during Mass in St. Peter's Square and later in his formal "Urbi et Orbi" Easter message delivered from the balcony of St. Peter's Basilica, Francis reflected on a litany of suffering in the world, including wars, oppressive regimes, human trafficking, corruption, famine and domestic violence. He encouraged people to hold fast in their "fearful hearts" to faith, acknowledging that many people wonder where God is amid so much evil and suffering in the world. Some 60,000 people, including multi-national throngs of pilgrims and tourists, endured tight anti-terrorism security checks - and, later, a brief downpour - to hear Francis and receive his blessing. The crowd size, cited by the Vatican security forces, was smaller in comparison to some other Easters, when about 100,000 turned out for the occasion. After Mass, Francis toured the square in his open-topped, white popemobile and waved back to well-wishers. In his balcony address, Francis prayed that God would sustain those working to comfort and help the civilian population in Syria, "prey to a war that continues to sow horror and death." He cited the explosion Saturday that ripped through a bus depot in the Aleppo area where evacuees were awaiting transfer, killing at least 100 people. "Yesterday saw the latest vile attack on fleeing refugees," the pope said, also praying for peace in the Holy Land, Iraq and Yemen. Separately, in a letter he sent to the bishop of Assisi, the birthplace of St. Francis, whose name he chose for his papacy, the pope decried the "scandalous reality of a world still marked by the divide between the endless number of indigent" and the "tiny portion of those who possess the majority of riches and presume to decide the fates of humanity." 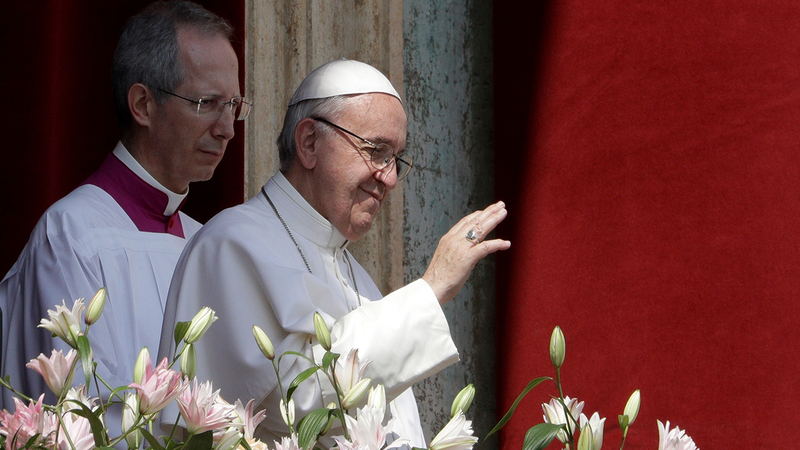 Francis has repeatedly championed the dignity of migrants fleeing war, persecution or poverty. On Sunday he recalled "all those forced to leave their homelands as a result of armed conflicts, terrorist attacks, famine and oppressive regimes." The church's first pontiff from Latin America voiced concern over the "political and social tensions" in the world as well as the "scourge of corruption" on his home continent. Francis also mentioned hostilities and famine plaguing parts of Africa. Speaking of Europe's problems, Francis cited the continued conflict and bloodshed in Ukraine and prayed for hope for those struggling with high unemployment, especially young people. Traditionally, the pope gives no homily during the late-morning Easter Mass, saving his reflections for the "Urbi et Orbi" message at noon. But Francis broke with that tradition, giving an off-the-cuff homily during Mass about what he described as a nagging question for many faithful: Why are there so many tragedies and wars if Jesus has risen from the dead, a belief that Christians celebrate each Easter? "The Church never ceases to say, faced with our defeats, our closed and fearful hearts, 'stop, the Lord is risen.' But if the Lord is risen, how come these things happen?" Francis asked. He gestured toward the potted hyacinths, tulips and daffodils, which came from the Netherlands, and which were arranged in neat rows on the steps leading to the imposing church. Easter "isn't a party with lots of flowers. This is pretty, but it's not this, it's more than this," Francis said. He said having faith on Easter gives sense in the middle of "so many calamities: the sense of looking beyond, the sense of saying, look, there isn't a wall, there's a horizon, there's life, there's joy."